Here in the arid American Southwest – specifically Arizona – honey bees and beekeeping are distinctly different from other parts of the United States, like Ohio, Indiana, Montana, or North Dakota. These differences come from the fact that many Arizona beekeepers are working mainly or exclusively with Africanized, “killer” honey bees. Our domesticated colonies are living in a desert “sea,” surrounded by healthy, thriving, feral colonies of Africanized honey bees. It is rare, but sometimes people who are not beekeepers are attacked and even killed by Africanized honey bees – not by the “killer” bees in our hives – but by these wild and feral colonies. These deaths have happened in Arizona, New Mexico, Texas, California, and Utah. 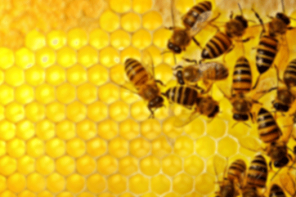 The commentary was written mainly for an audience of non-beekeepers, but what it has to say about Africanized bees is relevant to beekeepers, too. As a beekeeper yourself, what do you think about these issues? If the Africanized bees come to where you live, how will you respond? The extreme defensiveness (“aggression”) of some Africanized bees is their major “bad” characteristic, of course. But what are some of the good things (like resilience) that these bees have already brought to beekeeping and beekeepers in Arizona and the rest of the “Africanized zone,” north of the USA/Mexico border? Exploring and considering these kinds of questions is what this commentary is all about. As an Arizona resident who is also a beekeeper, I was saddened to read of a man’s death by honey bees in a story that was published by the Camp Verde Bugle on Wednesday, July 12, 2017. This man’s death is a tragedy, and I extend my condolences to his family and friends, on my behalf and on behalf of the Northern Arizona Organic Beekeepers Association (NAOBA). Here in Arizona and the Desert Southwest we have been living with a different kind of honey bee since the early 1990s. This honey bee, of course, is the so-called “killer” bee, or “Africanized” honey bee. Although she is the same species (Apis mellifera) as the temperate honey bee that our Spanish-speaking and English-speaking ancestors brought to the Americas from Europe beginning in the 1500s, her origins are in southeast Africa. Africanized honey bees are of (dry) tropical origin. Evolution and ecology have adapted these bees to a much drier and harsh environment than the wetter, more verdant environments of northern Spain, England, and Germany. The dry, thorn-scrub savannah that Africanized honey bees came from in South Africa and Tanzania are remarkably similar to the dry mesquite/acacia savannah of central Arizona and the Verde Valley. Here we also have the “prickly,” arid-adapted plants and dry/wet seasons of the Africanized bees’ former homelands. After having been imported as a few dozen African queens from South Africa/Tanzania to Brazil in 1956 – to help improve the struggling Brazilian honey industry – Africanized honey bees spread rapidly northward through South, Central, and North America. They have been in Arizona since the early 1990s. Today, the honey industry in Brazil is thriving, and all of that honey (much of it imported into the United States) is being produced by beekeepers who are working with productive and resilient Africanized honey bees. Meanwhile, the temperate/European honey bee that most industrial beekeepers in the U.S. rely upon is suffering from Colony Collapse Disorder (CCD) and other maladies. 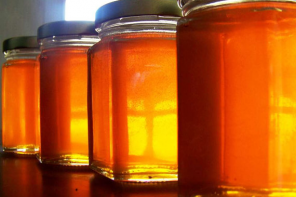 Over two-thirds of the honey consumed here in the U.S. is imported from other countries, like Brazil. It was “killer bees,” of course, who killed the man who was driving a backhoe in the Wickenburg area on Tuesday, July 11, 2017. We mourn his death. At the same time, we need to inform and educate ourselves about how and why this tragedy happened, in the hopes that perhaps another such death by honey bees can be prevented in the future, especially here in central and northern Arizona. So-called “killer” bees are not really killers, except on these rare occasions. In fact, these “killers” are much more about life than death, because, like other pollinators, they pollinate (fertilize) so many of the fruits, vegetables, and nuts that we eat. To make their own living as “florivores,” gathering nectar and pollen from flowering plants, they do not kill any other species, period. Can the same be said about human beings, even those who choose to eat plants only? Unlike a colony of temperate/European honey bees, a colony of tropical/South African honey bees does have the capacity to kill another species, whenever that colony (a single organism) feels as if its own life is threatened. When temperate honey bees feel threatened, one or more guard bees will sting whatever is threatening them (a hungry black bear, for example), but only a handful of bees or a few dozen at most will do the stinging. Because of the fishhook-like barb on her stinger, each honey bee who stings also dies. She gives up her life in order that her colony may live. 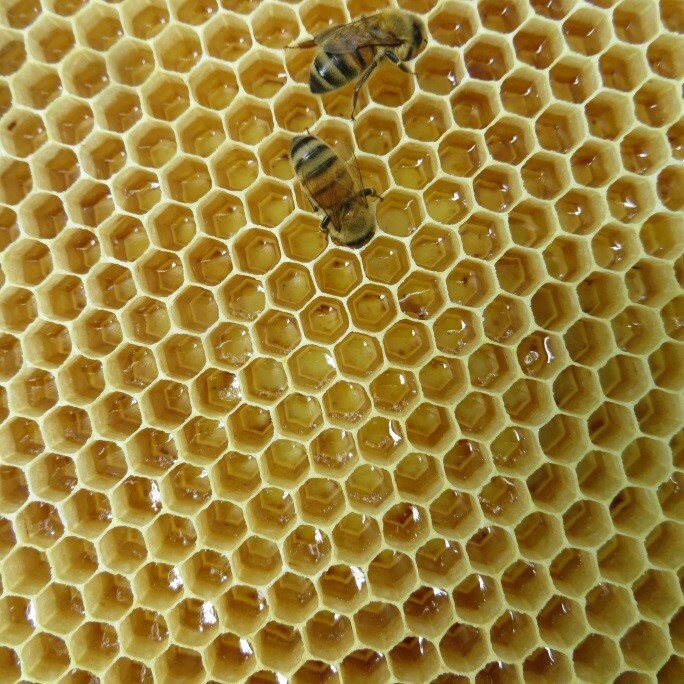 Because they evolved in a dry tropical environment, and in a different relationship with human beings (until recently, the “killer” bees were not domesticated), some Africanized honey bee colonies respond much more defensively than temperate honey bees to a real or perceived threat to their life and well being. A disturbed tropical colony’s response to a threat is much more social than the typical European colony’s more individualized response. 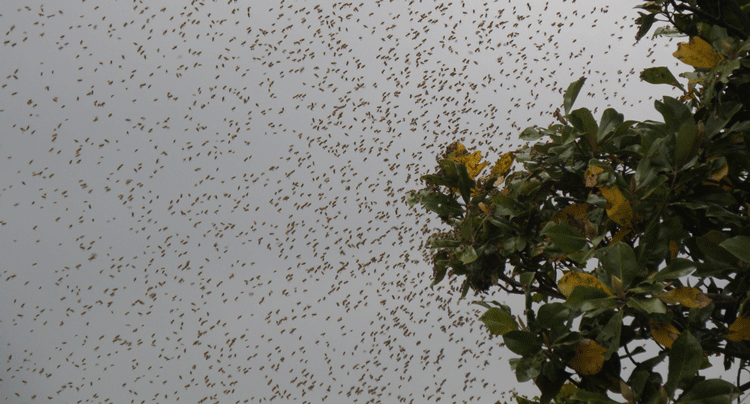 Once the alarm pheromone (which smells a lot like a banana) is in the air, nearly an entire colony of many thousands of individual bees will together attack whatever seems to be threatening them within their close vicinity. In South Africa, that might be a honey badger or a human being who is a honey hunter. Here in Arizona, it might be a person who is operating a loud, vibrating machine, like a lawnmower, a weed eater, or a backhoe. Honey bees don’t really hear, but they do have an acute sense of smell (better than a dog’s), and they are sensitive to nearby vibrations, especially from heavy machinery. If the vibrations are perceived to be a real threat, many thousands of bees can attack that threat by stinging and attempting to suffocate what they identify as a predator. Thousands of honey bees may die in defense of the hive, but that’s a worthwhile sacrifice for a species living in a dry, tropical environment. The rains may not come again for several months, but the colony that just sacrificed much of its population in defending itself will still be alive when the moisture and flowers finally return. Until that happens, the colony will still have the food and babies that it protected from its attacker. In a much more lush, temperate environment, a European colony will defend itself by delivering only a few dozen stings to a predator, who might be able to steal ALL of the colony’s food and brood (babies), if the attacker can get beyond this first line of defense. Losing much or most of a colony’s stores is a regrettable but tolerable loss, because, except in Winter, there will be plenty of moisture and flowers for the colony to rebuild itself, even from “scratch.” The rains and flowers are much more predictable in a temperate environment. For temperate honey bees, the dying of so many bees in defense of the colony would not be worth it. For tropical honey bees, however, who evolved in a mainly dry, more unpredictable environment, losing so many bees to protect the whole colony IS worth the sacrifice. Therefore, when threatened, especially when food is scarce and the weather is hot and dry, a threatened honey bee colony attacks “enmasse.” This response might have been different in May or June, when the weather was slightly cooler and the mesquite trees were still covered in flowers. Even temperate honey bees are often “crankier” when it’s hot and dry and the colony is hungry for fresh nectar and pollen. It’s the same in the Fall, when the flowers are fading away. All Western honey bee colonies have moods, just like us. All Western honey bees (Apis mellifera) have also evolved to protect their precious honey stores and wax combs by going for a mammal’s face, mouth, and eyes: where we are most vulnerable. That vulnerability is why we beekeepers wear a veil. Africanized bees often suffocate people or other animals by entering their nose and throat so that they can no longer breathe. If the man who was driving the backhoe on a very hot July day had only been wearing a veil, it’s possible that he could have avoided death. Once the bees attacked because the backhoe hit their combs or the machine’s vibrations set off the alarm pheromone, he could have escaped with only a few dozen or even a few hundred stings. The veil would have protected him. Most people, of course, don’t wear veils when working outdoors, except for beekeepers. But there are other “pro-active” things that we can do to prevent tragedies like this one from happening and that we can do if we find ourselves in a situation where we are under attack by a colony. First, be very aware and careful if you are using loud, vibrating machinery outdoors, like mowing the lawn. Be very aware of your surroundings and look for hidden places where a colony of honeybees might be living. Look for holes or cracks in walls or eaves where forager bees may be coming in and out. Some Africanized colonies may even be living in completely exposed places, like underneath the eaves of a house. If you are unsure about the possible places where a feral colony may be living on your property, contact a local beekeeper to consult with you. After years of experience, we can often see where they are, when others cannot. Beekeepers call these “feral” colonies: these are essentially wild colonies of bees that are not regularly interacting with human beings, like beekeepers. These feral colonies are the most potentially dangerous. If you encounter a feral colony on or near your property, call a beekeeper first and a pest control operator second. A beekeeper will usually remove a feral colony alive. It is skilled work that takes time and expertise, so a fee will usually be charged. Usually, that fee will be the same or less than what a pest control operator will charge for killing the bees. Second, if you come across a colony of feral honey bees (99.9 percent of Arizona’s feral colonies are Africanized), don’t panic. Honey bees are incredibly hard workers. They may be working so hard that they won’t even notice you. Respect them and do not get too close to them or disturb them in any way. Remember also that not all Africanized honey bees are highly defensive (“aggressive”). In my own experiences as an Arizona beekeeper, I (and many others) have discovered that some of the “killer” bees are highly defensive and even dangerous; others are only moderately defensive, depending on the season and other factors; and others are entirely or nearly docile, just like most of the temperate honey bees. The “killer” honey bee is a gross stereotype. We need to get beyond such distorted, one dimensional thinking. Third, if you come into the presence of the dangerous and powerful force of nature that is an attacking colony of Africanized bees, cover your face (mouth, nose, and eyes) with your hands or with a shirt or hat and run as fast as you can to the closest indoor shelter, like a house or car. If no such place is available, keep running until the bees give up their pursuit. If you still have your wits about you, run through shrubs, trees, or bushes so that the pursuing bees will lose your trail. They are less likely to pursue through dense vegetation. The chances of being attacked and killed by a colony of Africanized honey bees are about the same as your chances of being killed by lightning. Of course, here in Arizona, we have plenty of both, and especially of lightning during monsoon season. But there are ways to avoid being attacked or struck. Even so, sometimes it happens. Nature bats last. We beekeepers are very concerned about public safety and about the public’s understanding of honey bees and of beekeeping in general. 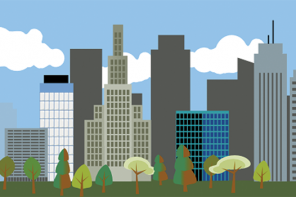 Here in Arizona, the reality is that many of us are working with Africanized honey bees. We have to, because the temperate honey bees do not thrive in the desert. By our carefully working with these bees, learning how to interact peacefully with them and by selecting the most gentle queens among the “killers,” we are actually helping to “cool down” the most defensive Africanized honey bees that live among us, both in hives and in feral situations. Today, in contemporary Brazil, the beekeeping industry is thriving, and far fewer people are being stung or killed by honey bee colonies than during the 1960s, following the initial “African” invasion. Over time, beekeepers and the public have adjusted to the new reality, just as the bees themselves have adjusted themselves to a new continent, and to new but familiar places like the Verde Valley, where they are thriving. If the Brazilians have done it, then we Arizonans can, too, and we can do it in our own unique and successful ways.